Every time the national anthem plays, I am moved to tears. I’ve lived in the United States for 31 years. Since I was a 13-year-old boy trapped in the United Kingdom’s foster care system, I dreamed of living in America. While most boys had posters of soccer stars covering the walls of their bedrooms, I plastered my bedroom with pictures of New York City. Instead of car magazines, my bedroom floor was littered with travel magazines. As a child, I had two dreams: to move to New York City… and get a job on Wall Street. By age 16, I found my way to the Big Apple. A month after my 18th birthday, I landed a job at Lehman Brothers. Two years after that, I became the youngest vice president in the history of Shearson Lehman. I gave all I had to pursue my dreams, and America gave back in spades. I can’t convey in words how I feel about this country. Love is not strong enough. America gave me everything I value: opportunity, mentors, love, friendship, and the type of painful life lessons only a free market economy can provide. But my feelings of gratitude and patriotism aside, make no mistake; this country I love is on the brink of an ideological civil war that threatens to tear us apart economically. According to a June 2018 Rasmussen poll, nearly one-third of Americans think a second civil war will break out in the United States within the next five years. The Pew Research Center found Democrats and Republicans are more ideologically divided than in the past. 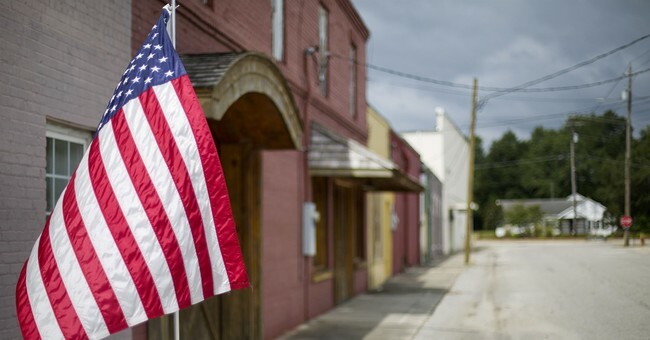 And a Gallup Poll released on July 2—just two days before our Independence Day—found that a record-low number of Americans are proud of their country. Our power as a nation lies in our unity. But an important faction of the country is quietly making moves at the local and state levels to economically decouple from the United States. The steps being taken by a handful of renegade states threaten our most powerful strategic weapon. No, I am not talking about our nuclear weapons. The main weapon that protects our economic freedom is the supremacy of the U.S. dollar. Our economic output, coupled with the fact that virtually all commodities are priced and traded in U.S. dollars, is at the heart of America’s global supremacy. The rest of the world’s constant demand for dollars means America can do things other countries can’t. America can run up enormous national debts. It can outspend the rest of the world (combined) on defense. It can print stacks of money with virtual impunity. And it’s all because the rest of the world uses the dollar to buy everything it needs… from corn, to copper, to oil, to gold, to coffee. Whether other countries want to use dollars or not, they HAVE to use them if they want to buy most commodities via international trade. That gives the U.S. a huge strategic advantage. But now, that edge is under attack. And the attack isn’t coming from the usual suspects abroad. Over the last few years, many smart people have feared the death of the dollar. Their fear stems from three main sources. It’s no secret China hates our economic and military supremacy. Many bright people fear China will band together with other nations to switch from trading in the U.S. dollar to China’s currency, the renminbi. In May 2018, the central banks of 14 eastern and southern African nations met in Zimbabwe to discuss adopting the renminbi as a reserve currency for Africa. The so-called BRIC bloc (Brazil, Russia, India, China) also has called for an end to the dollar’s supremacy as the world’s reserve currency. And in 2016, the International Monetary Fund (IMF) added the renminbi to its basket of international reserve currencies… joining the dollar, euro, British pound, and Japanese yen. These moves have many people fearful that the renminbi will displace the dollar. I’ve never bought the story for a simple reason: China lies about its economic growth. That was the cover of the May 7, 2012, Bloomberg Businessweek magazine. And it’s still true today. Now, I’ll be the first to admit the U.S. does its share of truth-stretching, too. However, when it comes to trusting the world’s wealth to one currency, no one trusts China enough to solely rely on the renminbi. Say what you want about the United States… but it respects property rights. That’s why foreign countries hold more dollar-denominated investments than any other foreign currency. The rest of the world may not like us… but they’ll trust us with their money before they’ll trust China. Long story short: Forget China. Its currency won’t topple the dollar in our lifetime. $20 trillion and counting. That’s how much the U.S. owes its creditors. We will never repay our national debt. Ever. Let that sink in. The debt fear argument maintains the rest of the world will get fed up with America’s profligate spending and stop buying U.S. Treasury bonds. After all, if you or I continually spend more than we earn, and borrow to make up the difference, we’d eventually go bankrupt. Many brilliant people believe that if foreign governments stop buying our bonds, America’s only choice will be to print the dollar into worthlessness. And yet, here we are, $20 trillion later and the world’s appetite for our bonds remains undiminished. The first reason is because the U.S. currently offers the highest interest rates in the world when compared to other major economies. Our interest rate is almost 3%. The rates for Germany, France, and the United Kingdom are at, or near, 0%. And Japan actually has a negative interest rate (-0.1%), which theoretically means you get paid to borrow money. Secondly, our debt buyers know that if things get really bad, the U.S. government can simply ram through higher taxes. As large as our debt is, foreigners know America has a massive tax base it can pillage to pay its bills. The argument that too much U.S. debt would make the dollar worthless has been around since the early 1980s. Many people continue to believe it, but I don’t. When the dollar dies, it won’t be because of our debt. Surely digital currencies will bury the dollar? There is a growing number of folks who believe this is true. The argument goes like this: Cryptocurrencies (such as bitcoin) have a limited supply, are easily divisible, and are currently impossible to counterfeit. So why should we use dollars that are backed by nothing—and that the government can print on a whim—when we can buy bitcoin, which has a fixed supply? It’s no secret… I’m a huge proponent of bitcoin. I believe it will see a tremendous rise in value. But compared to the U.S. dollar, bitcoin is too small and volatile to be taken seriously as a global currency in the short term. At the time of this writing, the total market cap of bitcoin is just under $141 billion. That’s a tiny blip compared to the more than 10 trillion U.S. dollars in the world. Perhaps in the distant future, bitcoin might have a shot of displacing the dollar. But I doubt this will happen in our lifetime, either. So if China, U.S. debt, and bitcoin won’t dethrone the dollar… what will? After all, we have an ocean to the east of us, and an ocean to the west of us. We have Mexico to the south and Canada to the north. Seriously, who poses a real threat to America? It’s the emergence of a new domestic threat—combined with a new technology—that has me seriously concerned for the future of the U.S. dollar. I wrote this essay to warn you that the U.S. dollar will be dethroned. The threat only becomes obvious after the damage has been done.